VANCOUVER - The wealthy Vancouver-area woman accused of trafficking a young African single mother to Canada to be an unpaid housekeeper used "fraud, deception and coercion" to trick the woman and fool immigration officials, a Crown prosecutor said Friday. Mumtaz Ladha, 60, is on trial for human trafficking and other immigration-related offences over allegations she illegally brought the woman into the country in August 2008 and forced her to work long hours without pay at Ladha's home in West Vancouver home. The Crown's theory has been that Ladha lured the young woman, whose name is covered by a publication ban, to leave her native Tanzania with a promise of a job at a Vancouver-area hair salon, which didn't actually exist. To do this, the Crown contends Ladha repeatedly lied to immigration officials in African and Canada, first to obtain the woman's initial travel visa and then to obtain a visa extension five months after the woman's arrival. "There's a pattern of fraud, deception and coercion that occurs here," Crown lawyer Peter LaPrairie said in his final arguments on Friday. 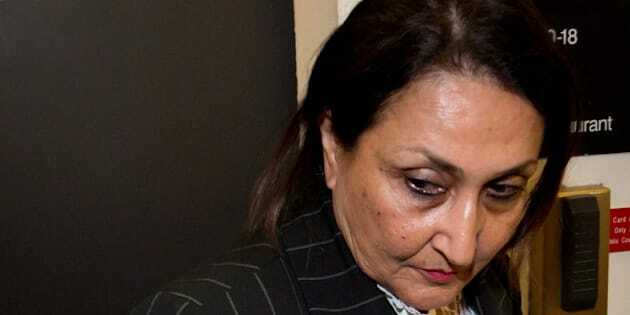 "Mrs. Ladha used means of coercion, deception and fraud to convince (the woman) to come to Canada. She misrepresented the circumstances of the travel in the application for the visa. And she misrepresented the circumstances for the stay in Canada in the extension." LaPrairie said the lies began in Tanzania, where the woman worked as a cleaner at a hair salon owned by Ladha in the city of Dar es Salaam. The woman had previously worked for Ladha as a housekeeper. The woman testified she was initially reluctant to travel to Canada, but Ladha offered her a job at a salon in Vancouver making $200 a month — twice what she was earning in Tanzania. All along, Ladha's plan was to use the woman as her personal maid, LaPrairie said. Ladha then helped the woman apply for a passport and a travel visa, filling out the forms in English. The young woman only knew Swahili. The trip to Canada was described on the application as a two-month stay to allow the woman to help Ladha with a medical condition. The trial has heard evidence Ladha suffered from vertigo and osteoarthritis, but LaPrairie said there was no evidence the woman had ever assisted Ladha with medical tasks, even when she was Ladha's housekeeper several years earlier. On the travel visa application, the young woman was described as Ladha's longtime personal assistant and caregiver, even though at the time the woman was working at Ladha's salon. "This isn't just a mere slip," said LaPrairie. "This is an attempt to mislead the authorities on the purpose of the visit, the length of the visit, and their relationship." By January 2009, five months after their arrival, Ladha took the woman to an immigration consultant to apply for an extension to her visa, the trial has heard. The information on that application, which LaPrairie said was provided by Ladha, indicates the woman needed the extension to continue to help Ladha with her medical problems. However, Ladha already had plans to spent the next six months in Africa, LaPrairie said, and she left the woman behind in Canada several weeks after submitting the visa extension application. LaPrairie said the only explanation is that the answers provided for the visa extension were lies. The judge hearing the case agreed there were inaccuracies in the various immigration forms connected to the case, but she also questioned whether such errors meant Ladha was guilty. "There appear to be some statements made on the visa applications which aren't easily explained as mistakes or carelessness — the question is: at one point do they become criminal?" asked Judge Lauri Ann Fenlon, who is hearing the case without a jury. "If there are statements that are false, or knowingly false, that could affect the decision (of an immigration officer), they should be subject to sanctions," replied another Crown lawyer, Charles Hough. In June 2009, with Ladha still in Africa, the alleged human trafficking victim left the West Vancouver home and relocated to a women's shelter. Ladha returned to Vancouver in August of that year. Ladha was charged in May 2011 with human trafficking, employing a foreign national without authorization, misrepresenting facts to the High Commission of Canada in Tanzania, and misrepresenting facts to Citizenship and Immigration Canada.